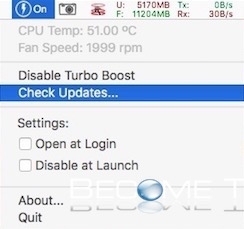 Turbo Boost is a feature on modern day Mac computers that allow a processor to increase and decrease clock rate (processor speed) as Mac OS needs it. There are benefits to Turbo Boost including energy conservation, increasing battery life, and generally increasing your Mac machine life. There are a lot of Mac geeks that would like to control when Turbo Boost is on and off. Note: Your Mac must be a compatible model to be able to use Turbo Boost. The current list of compatible Macs can be found here. 1. Download and install Turbo Boost here. 2. Double-click the Turbo Booster application. You will see a menu bar item added. 3. And like that, you can turn on/off your Mac machine Turbo Booster settings using the Turbo Boost Switcher menu item.